If you enjoyed yesterday's Fifty Shades of Grey Ricky Gervais spoof billboard, then you'll probably appreciate the humour behind Comedy Central's Roast of Justin Bieber. 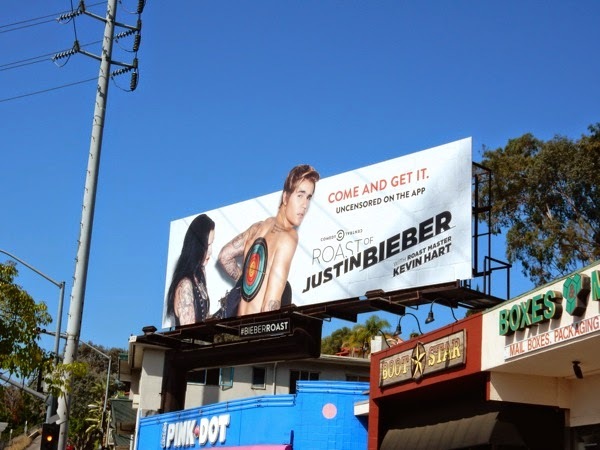 Just as the billboard suggests, the young tattooed pop star has a target on his back and you don't need to be a 'Belieber' to enjoy seeing the 21-year-old getting torn apart by friends, celebrities and comedians alike (all for fun of course). The master of roast ceremonies is Kevin Hart, but expect the Beibs to be ridiculed by the likes of Will Ferrell, Snoop Dogg, Jeff Ross and even Martha Stewart (who all know him personally we're sure). This fun special extension billboard was snapped along Sunset Boulevard at the top of La Cienega Boulevard on April 1, 2015, and if you like this ad creative, be sure to also take a look at these sequential James Franco Comedy Central Roast billboards and this Roseanne Barr Roast billboard. If you're a fan of the Canadian singing sensation, be sure to also check out these Calvin Klein billboards featuring Justin Bieber and Lara Stone.